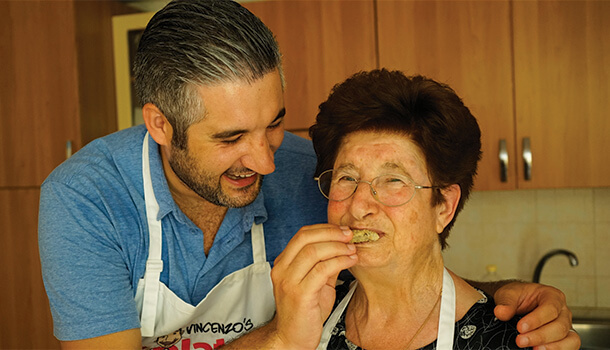 Fried Ravioli are a traditional dessert recipe made at Christmas time by my Nonna. 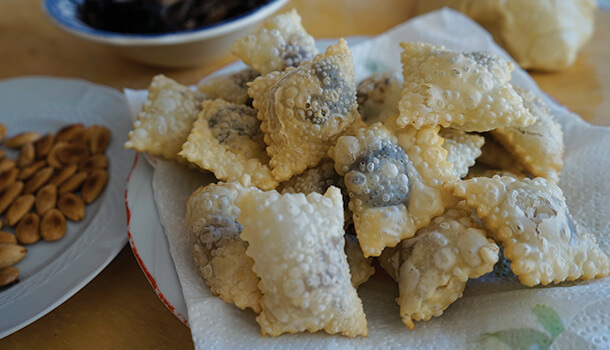 Shaped like savoury ravioli, these sweet morsels of goodness are crispy on the outside and oozing with grape jam on the inside. 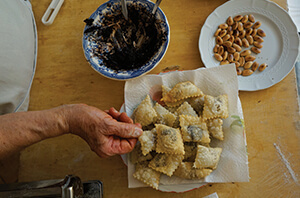 These fried ravioli are a delicious treat which can also be enjoyed with alternate fillings such as other fruit jams, ricotta and cinnamon or even Nutella. In a bowl add the grape jam, crushed toasted almonds, grated chocolate and mix very very well. Pour 500g plain flour on to a board or breakfast bench. Slowly but surely knead the dough for at least 6-8 minutes or until it forms into a ball and has a soft, smooth consistency. Once the ball of dough has formed, pat it down and leave it to rest underneath a large bowl so that no air gets inside. Remove the large bowl from covering the dough and cut a small piece from the end of the dough for the fried ravioli. Preparing your pasta machine on a thicker setting, run the dough through it between 3-4 times. Then gradually work your way down the settings, as the dough becomes thinner, until you have a long strip of dough and it is thin (but not too thin!) and smooth. Using a spoon, divide small portions of grape jam into the bottom half of the strip of dough, separating each one by a few centimeters. Carefully fold the dough over the top, covering the filling and creating what looks like an extra-large calzone! Using the ravioli cutter, cut small portions and put them in a tray to the side. Cut another slice of dough and repeat steps 12-15 until all your dough (or your jam!) is gone! 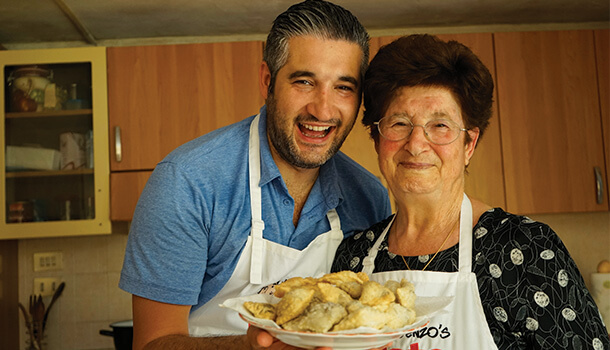 VINCENZO’S PLATE TIP: Prepare a couple of trays before you get started with some plain flour so that none of the fried ravioli stick to one another on the trays before you have cooked them. Heat up the sunflower (or vegetable) oil in a medium size saucepan. Once it is warm enough, carefully put 5-7 ravioli inside and fry them. Make sure you turn over each ravioli gently so they cook right through and be careful not to overcook them! Once each fried ravioli is ready, place it onto a tray lined with paper towels so the excess oil can be absorbed. Place the fried ravioli onto a bright coloured plate and sprinkle some icing sugar over the top. These can be served right away or you can also serve them once they have cooled. E ora si mangia, Vincenzo’s Plate …Enjoy! 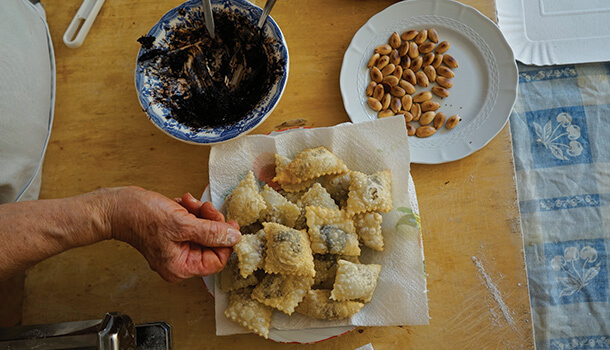 These sweet fried ravioli known as Caggiunitt or Caggionetti are perfect to make during festive seasons like Christmas and Easter.